View of “Lado a Lado,” 2016. The work of Willys de Castro is less silent than we assume. 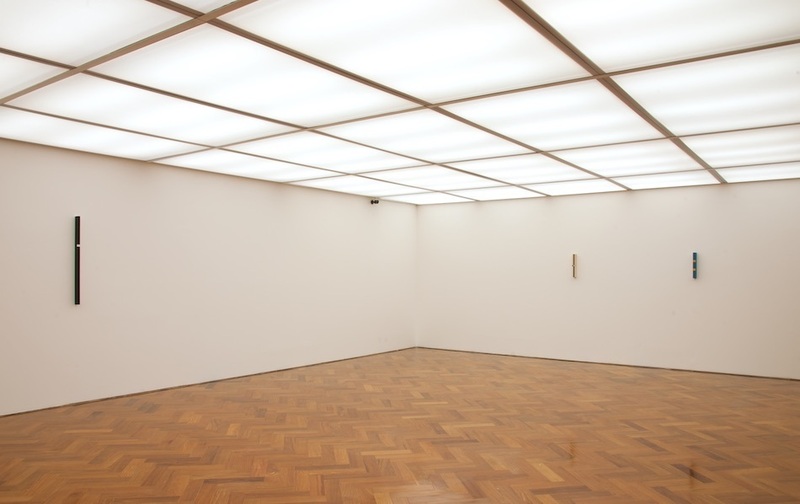 Sparsely hung with only two or three artworks in each of the exhibition’s four rooms, the Neo-concrete artist’s latest solo show gives his “Objeto Ativo” (Active Object) series, 1959-1962, enough space to breathe. Some of his most famous and influential pieces are on display, and the slender pieces of wood covered in geometric patterns engage with poems by the artist—many unknown until now—that are shown alongside the works. “Lado a Lado,” Portuguese for “side by side,” is the title of one such poem and also the name of the exhibition. It couldn’t be more fitting, as each artwork in “Objeto Ativo” is painted with a balanced and dualistic composition of complementary colors. On the typed page, the a in “lado a lado” is slightly below the rest of the words, occupying a place analogous to that of the viewer standing before the art, which hangs at a slightly elevated position on the wall. Somewhere in between, beholders are subject to the faint glow of two distinct chromatic experiences merging. When he invented the Objeto Ativo in 1959, Castro was thinking about how art can trigger spontaneous choreographies in space. He hoped to manipulate the bodies of his audience in much the same way as Neo-concretists Hélio Oiticica and Lygia Clark. But unlike his Carioca colleagues, Castro lived in Brazil’s largest city, São Paulo, and sustained some of the austerity of the Concrete school that originated there. His oeuvre is thus closer to industrial design and less organic in nature. Here, we see him at his peak, poised between the rigidity of the concrete jungle and the Neo-concretist desire for movement that blossomed in Rio.